I still have my Sweet Sue kit from Noel Mignon out on my scrap table. I am loving this kit so much! I think the embellishments really make the kit because a lot of them are things I probably would have been hesitant to buy on my own. I thought some of the patterns in the kit would work well with Kevin's First Communion photos (from May), so I've had a stack of photos waiting to be scrapped all week! There was a sheet of Hambly rub-ons in this kit and I decided to use the whole sheet on one layout. I just cut the sheet in half and positioned them in the top and bottom right corners on white cardstock. 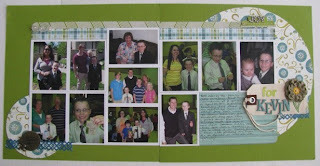 This layout of the family before Kevin's First Communion is really simple, but I like it. I drew in lines for my journaling. My next layout is a 2-pager for Blake's album. He started serving at Church last year. It was extra special having him serve the day of Kevin's First Communion. I love the shot that show them both exiting the church. Although this is a church layout, it's a little bright. 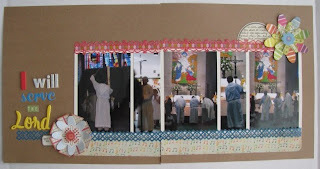 I worked with brighter colors that are in the stained glass and artwork in the photos. I think we have a beautiful church. Just last night I was able to finish up this 2-pager for Kevin's album. 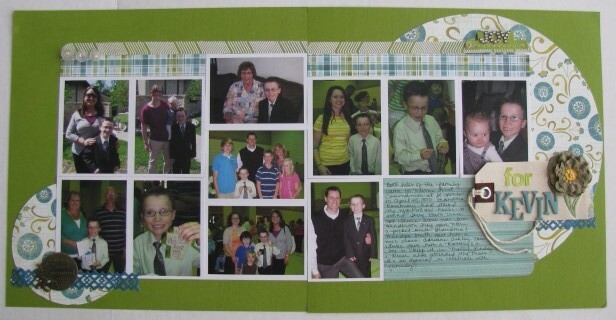 I made 2-up 4x6 prints of everyone who came to his First Communion. 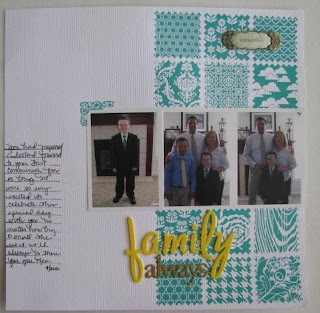 Lucky me I had another sheet of the green American Crafts cardstock that was in my kit so I make this a double page layout. I cut some circles out of the patterned paper to soften the layout a bit. I also used the Prima tag from the kit for my title. I didn't like the "be" that was on it and the flower on it was too bright for my papers, so I covered it over with a brown Prima flower (also from the kit). I would like nothing more than to sit at my scrap table and scrap the rest of the day and night away, but we have Scouts on the agenda tonight. Blake has worked really hard and we are looking forward to the award presentation tonight at his Court of Honor. These are wonderful layouts, Amy. I really like the two-pagers.